The brackets there are mounted backwards; the long end should go against the wall. When they rate the brackets to hold 1000 pounds, it's based on a load at the center of the short side. But really the risk comes from the mounting. If you mount a 30-inch-deep hunk of desk on it there is a much higher stress on the mounting points since the long desk acts as a very effective lever. If you lean against the edge of the desk it may well pull the bracket out of the wall--especially if you use typical screws rather than lag bolts to mount it to the wall. If you are mounting something like this in a corner, as being done here, the whole setup could be strengthened by mounting a ledger board against the right-hand wall to support the entire depth of the desk. Really you should have a support on the front-left corner as well, which can be done either with a dowel or furniture leg (you can get either at a hardware store). I thought this at first, but if you look at a bracket like the one in the article on Amazon, it seems that they are mounted correctly, since amazon describes its depth as 19.5", and a height of 13". Those brackets are different than what I would call standard shelving brackets, which should be mounted with the long side against the wall. I've never seen a bracket meant to be intentionally mounted long-side-out, but I agree they seem to be advocating it there. You could do it if the loads were light, of course, but with a deep shelf and/or heavy loads it creates a lot of pull-out stress on the screws near the 90-degree bend. Not for mounting a desk! For things like pictures where the stress is mostly shear (downward force), you can use something as simple as an angled nail and hang five or ten pounds of picture frame on it. Wall plugs, especially the ones that expand behind the wall, do provide better resistance to pulling force. But these desk brackets will have a LOT of pull applied to them because of the leverage of the desk surface. Some plaster against the ribs of that plug are not enough; it will likely yank out of the wall and may take a chunk of wall with it. In older plaster-and-lath construction, you'll most likely crack/damage the plaster from the flexing caused by the plug pulling against the lath in the wall. As the original article says, you'll want to hit a stud, and IMO even that (alone) is not enough for this kind of application. If the old apartments in Germany are anything like those in Belgium, the inside walls are probably plastered brick (or worse - concrete). Wooden houses are a rarity here. Living in old buildings I've never encountered one of these walls built around a wooden frame. Yes, they are mostly plastered brick. By the way : concrete isn't bad as you think. There are different type of concrete.But... While it's strong and resistant to fire, if you live in somewhere where the earth quakes are common, concrete is a bad choice. Also metal frames in the concrete is problematic, they have to be resistant to the water (galvanized etc.) or in time they will rust and tear apart the concrete. In America most houses are wood, and I don't mean log houses. And there is no way wall plugs would work in that kind of American wall. In Norway and Sweden we also have mostly wooden houses. I would imagine it's the same in Finland as well. Probably because we have lots and lots of trees here, compared to continental Europe. An idea that just occurred to me while reading this is that shelving racking, such as you see in most shops, would be ideal for this situation. I have some shelves just behind my desk mounted on this type of racking which have steel bars about 3/8" wide and are about 6ft tall screwed into the wall every foot or so. I believe the length of these would counter quite a lot of the bending stress (although thats not really my field) and as a fringe benefit they have mountings which the shelves hook into every 1 1/2" or so, this could even allow the desk to be lowered to a normal seating position with a little work. Also, I think that any failure of this type of racking would be fairly gradual. Similar to what is shown here http://www.richardsonsuk.co.uk/product.aspx?p=46 (no affiliation, just the first similar looking thing I came across on google). I've been using precisely that solution for several months. It's perfect, and I have absolutely no worries about weight, because there are several screws along the length of each bar. My laptop and monitor go on one rack, and my keyboard and mouse are on another, about a foot beneath the first. Good to hear it is working out for you, if I had any inclination towards having a standing desk at home I'd certainly consider doing it that way. There's a profession that's had standing desks for centuries. They're called draftsmen (architects, artists, and others). You'll find a great number of adjustable (height and angle) desks searching for "drafting table" with prices starting below $100 (new or used), and, well, as with much furniture, sky's the limit. They can be used as standing desks or (with a stool) as a seated workstation. As noted in comments below, many drafting stools have some sort of footrest. Add a monitor clamp/mount (either on the desk or on the wall behind it) and you've got a workstation solution. A hutch, shelving, or cabinet above, and an enclosed pedestal cabinet, and you've got a full desk. Senseless self plug - It's not adjustable, but for between $100-$200 (depending on quality of parts and whether or not you elect to sand/stain/seal) you can build this: http://imperialwicket.com/diy-adjustable-stand-up-desk-for-u... . It's not quickly adjustable, but with the removal and replacement of some bolts, you can adjust the main desk area from 30" height all the way up to 52". Built into the cost are four additional shelves of various sizes. My idea was that if I was going to spend close to $200 on it, I wasn't terribly considered about quick adjustments (and I agree with nick_urban that a high stool/chair is perfect if necessary). However, I wanted to be sure that if I needed a non-standing desk in the future, this could be easily altered. I could also easily adjust it to accommodate visiting/alternative users - which is harder with many of the wall-mounted stand-up desks that are out there. That looks pretty cool, I also built my own adjustable stand-up/sit-down desk, albeit a more minimalist version. I'll have to draw out the plans like you did before I go touting the benefits of it, but I had quite a fun time designing and building it, as it seems you did. The difference between a comfortable standing-desk height and sitting-desk height for me was 15 inches, so the desk surface is 15 inches deep, and can either fold up-and-out to be "Stand-up mode" or down-and-out to be "sit-down mode". That sounds excellent. I spent a long time thinking about techniques for expedient adjustment, and ended up deciding that I didn't trust my engineering skills (or lack thereof) enough to warrant the additional cost. I'm excited to see some more about your build, hope you can post details soon. This guy has well over $2,000 on this $40 "desk", even though this equipment will lose a lot more value over time than a good desk. A MacBook Air will be worth barely anything in 5 years, while you can probably make a desk last half a career at least. Same for a good office chair. I see the same responses in the comments thread of this blog. "$40 worth desk holding gadgets worth $4000? Seriously?" This line of reasoning makes no sense to me. Why does the cost of a desk need to match that of the stuff on it? Are you suggesting this home-made desk is not stable, that it puts the contents of it at risk? Sure looks stable to me. He might be able to justify $2000 on a Macbook Air because there may not be an alternative (depending on his work) or it may be justified with the perceived costs of the device. There's no point spending $800 on a desk if $40 does the job adequately. Cost is only loosely correlated to quality and value. It's the same line of thinking that goes "well you spend a third of your life sleeping so why do you spend only $200 on a mattress?" Perhaps because a cheap bed and mattress is perfectly comfortable for most people. I'm not saying the price of the furniture should match the price of what's on it. That wouldn't make sense. But it seems common to justify extra costs in the electronics because it's a tool for the job so you want the best thing money can buy, while it's also common to go the cheap way for desk and chair. We see the cost of the electronics as a necessary investment, but not for the furniture. At the end of the day, $2k in furniture is not that much. Sure a dining table works fine to hold my laptop, but it's just adequate. It could be severely improved. To me, this stand-up desk is like programming on a netbook: technically it does the job, but you can spend some extra money to have a much better setup. The thing is that a bad setup furniture-wise will hurt you badly in the long-term. As far as this particular desk, no it doesn't look quite stable. (also see dmethvin's comment) Plus the ergonomics are bad: the screen needs to be much higher than the desk surface. Do you really think the people who are advocating spending more think the desk looks stable and sufficient? As you say, that makes no sense, so why assume that? Wouldn't it make more sense to think they feel differently about the quality of the desk? The reason i assumed that is because the comments discuss money. Why are we talking about money if it's just a question of quality? I'm sure you could build a stable and sufficient desk from raw materials for $40-$100. Way less than the value of what goes on it. What's money got to do with anything? Regarding my original comment, while I don't think this desk is of good quality, I was trying to comment more on the mindset we have around this. It's easy to build. It's sturdy, and it looks good. I have been using this desk for the past year now and it is awesome. What I dislike about the authors suggested setup is the fixed height. Often, the initial height that you set the desk to will become uncomfortable. As your body adjusts to using a standing desk, you will probably find that you would prefer something a few inches different from your initial setup. That would be a several hour project with something mount to the wall, but only takes about 15 minutes with these desks. I've got an older (and larger) version of that desk and really like it. I've set it up in standing mode before, but didn't really stick with it. It's worth checking Craigslist in your area too, there's usually people selling these desks pretty cheap. At least that's been my experience; got mine used for $70. EDIT: The Jerker (http://i.imgur.com/TyieC.jpg) is what I actually have (thanks chaostheory). they really are great desks and are very configurable. They consider it a bar table, but it works perfectly as a standing desk. At my height, bar tables are perfect standing desks, and bar stools are perfect if you want to sit down without having to think about changing desk height. Wouldn't it be awkward over long hours though? Specifically wouldn't you want the keyboard near your waist and the monitor closer to your head, as opposed to bending to look at the screen; or having to raise your arms closer to your shoulders? The keyboard is ~6 inches above my waistline, which feels perfect to me. The screens are the same distance from my head whether I'm standing or sitting. I keep a barstool by the desk for any periods when I am tired, although interestingly enough, I find that I sit when I'm learning, and stand when I'm producing (I'm a web dev). So exhaustion isn't the primary dictator of whether I'm standing or sitting. Is it ideal to be bending down (ever so slightly) to look at your monitor from an ergonomics point of view? Not sure honestly. I can't imagine looking up or down for long periods of time is good. Interesting, thanks. Do you think one could use only one of the two narrow shelves and put a large screen on it? Can it support the weight? That way you could have keyboard and screen at different heights. I think the larger Fredrick model can probably do it, since it has a no shelf variant. If not, I'm sure you can hack it to enable it to do so. For myself I have a larger discontinued model called the Jerker. It supports large things just fine. I wonder that as well. Product description mentions only table top, but the construction suggests that shelves also can be mounted at different heights. Indeed the shelves use the same mounting holes as the table top so they can be mounted in any order at any height. I went to Ikea and came home with the same desk for my home office. While the assembled height can be changed, do be aware that the increments are relatively large, like maybe 3 inches. It worked out fine for me, but might not be very comfortable for someone slightly taller / shorter. I found that without being able to easily switch between sitting and standing, standing work stations will probably not work for most people. I bought a geek desk and it solves the problem beautifully, but having two separate desks for sitting and standing is a cheaper solution if you have the room for it (or having a very tall stool). After trying a non-adjustable standing desk that I built for a period of two weeks, I came to a similar conclusion. It initially felt pretty good, but after a few hours had passed I ended up taking a lot of breaks that I normally wouldn't have, simply because my legs couldn't keep up. Also, my feet were in some serious pain for the first few days, even with a thick floor mat, and continued to lightly ache afterwards. Desk and laptop + couch or comfortable chair works pretty well for me. Co-worker who had a stand-up desk frequently migrated to his in-office couch by afternoon. An inexpensive standing desk is nice, but I don't think I would be any happier standing continuously than sitting continuously. Unfortunately, rapidly adjustable sit/stand desks are insanely expensive. How about a high desk that you can stand at, with a stool or drafting chair for when you want to sit? A tall chair seems a lot easier / cheaper than an adjustable desk. I considered it. Tall ergonomic chairs are very expensive. A top-of-the-line aeron is about $700; the stool version is about $1200. "Tall ergonomic chairs are very expensive." Do you need an ergonomic chair? In my experience ergonomic means with a too much bended back shape that will DISTORT(!) your natural spine shape. Unfortunately they use statistic to decide what is the ergonomic "best" shape, the problem is that people backs in the west have gotten less and less straight the same way they are getting more and more overweight. Instead of buying an expensive chair, in my opinion it is a best investment to buy a good book or take some good posture lessons that teach you how to sit, stand or sleep properly. Your back could support itself without effort if it is straight. I was of the similar opinion, but a research suggests that sitting straight is not actually as healthy. I'd like to see a source which would confirm that sitting back causes distortion to spine shape. That said, I agree with you that an ergonomic chair would make little sense for a standing desk, as one will obviously sit less (only when too tired to stand). I don't think it's obvious at all. I prefer to sit, but I am by nature a restless individual. A standing desk would allow me to make some of my pacing time productive. To put it another way: every person may have a different use pattern when given the option of equal comfort at seated and standing heights. I do this. I put my chair on a riser and it works just fine. I personally find that I rarely sit down at my desk, except for extremely long coding sessions. Having the ability to easily adjust my stance, wake a walk, flex my knees, and the like makes a huge difference. Your mileage may vary, obviously. Why not have a desk fixed at standing-height, and a stool / tall chair adjusted so that sitting in it leaves you at the same height as standing? Because then you would be forced to sit with your legs dangeling -- and that gets pretty uncomfortable too. Most tall stools I've seen have something at about the right height to rest your feet on, whether just a brace between the legs of the stool or a ring that looks like it's intended as a footrest. Even without that, a detached footrest would still be rather easy to find. "Because then you would be forced to sit with your legs dangling"
Most stools let you adjust the height without problems, so you could put your feet on the floor. Some of them you could even attach to the floor, so you could use it as a support. You'd probably want a stepstool or applebox anyway when you're standing, just to vary your feet positions. That could be used as a footrest when sitting. "An inexpensive standing desk is nice, but I don't think I would be any happier standing continuously than sitting continuously." You don't need to. You could buy a stool and sit down when you need it or want to. For me, it took 3 months to get the muscles necessary for standing up developed, and 6 to learn a correct posture good for my joints. Today I use a wall as support for my back while standing while I use the computer attached to another wall with a mechanic arm(vesa tv mount with an imac adapter). This is by far the best idea I could have, it feels totally different to work standing up. ...I don't think I would be any happier standing continuously than sitting continuously. 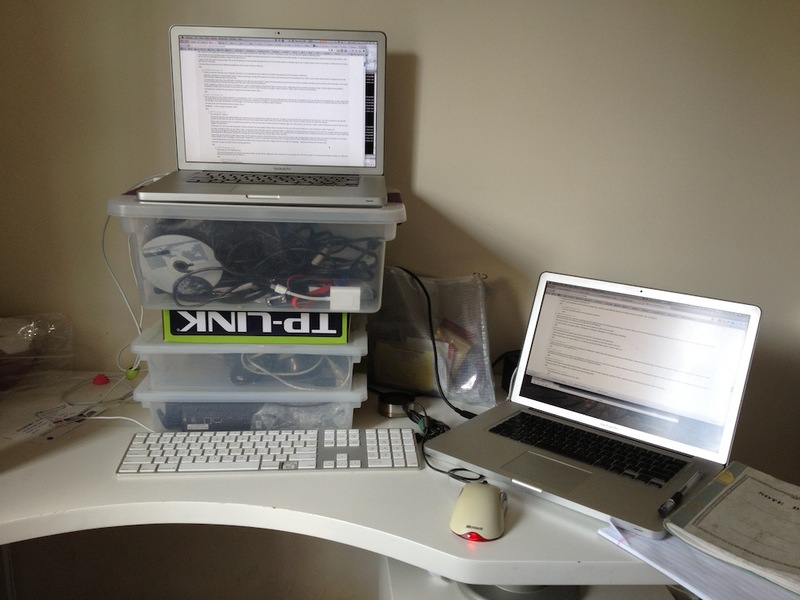 I came to the same conclusion after switching to a standing desk for a few months. Now I'm using a yoga ball and it's amazing. It's immediately intuitive: just sit on it and shift to another comfortable position if you've been in one place too long. My core is even getting stronger from balancing (although it doesn't feel like a workout). I have a 65cm one for desk-height and a 75cm one for counter-height. I highly recommend it. I find a stool not really a valuable fatigue reducer compared to a real chair. I couldn't handle standing all day, and the stool was better, but not great. I finally bit the bullet and went fully adjustable with a real chair, and it's so worth it. You should give it a shot for a week. I had facilities adjust one of the tables in my cube to be a standing desk and I'm very happy with the results. replicatorblog is going to help me by suggesting some stability and aesthetics improvements, but if anyone else cares to join in, you're more than welcome. The slots will be cut-out so you can adjust according to your height. My goal is something that can by cut with a CNC/laser cutter and then sold for ~$20. Seems a good number people like the idea of a motorised adjustable desk, but the price is a deterrent. I have a GeekDesk, or what near-as-dammit is one, via a UK importer who gets them from Europe and, personally, it's been the best £400-500 [edit: $600-800 USD, give or take] I've spent on hardware, ever, given that I spent most of my waking hours sat/standing/leaning at it. But I appreciate that it's not an easy price point for everyone. I would be comfortable at a $600 USD price point. The major issue for me is that the GeekDesk succeeds ONLY in the adjustable requirement. I want to be able to have my monitor and keyboards at different heights, and a secondary shelf was important (though not strictly necessary). When I consider paying nearly $1000 USD for a starter kit (GeekDesk large frame), then spec'ing out nearly $400 USD for additional monitor stands and a keyboard tray, it hardly seems worth it. I agree that it's a market where a motivated individual should be able to make a killing with a well-thought-out kickstarter proj. I don't know, man, but for those prices you'd think they could come in a color other than "cubicle." It has a manual hand crank, so it's a little cheaper, I get a little exercise cranking it up and down (though not much; it's surprisingly easy to do), and I get to feel that I'm not polluting the world with more electronics (I know, ridiculous we you consider what's actually sitting on it...). It is still pretty expensive, but it's really well (and precisely) made, so I can see that it could be expensive to produce. A motorized desk is a ridiculous waste of money. Get a draughtsman's chair; architectural offices hace always had standup desks so people can draw and build models. For me, it's as much about about changing position over the course of the day as it is standing up. So, I don't count mine as a waste of money. "Hanging a shelf is taught in Adulthood 101." I think I must have been sick the week they taught that. I still have great difficulty doing it (or building anything, working "with my hands"). You just need some practice and you'll get the hang of it. This honestly looks like a great way to smash a $1000 ACD on the ground with great force. Shelf mounts aren't made for lots of shearing force cause by constant up and down pressure like that. While the desk looks cool, I give it about a 1:10 chance of coming off suddenly within 5 years of daily use. That's not a desk, that's a shelf attached to the wall. It's strange to read this, because I was recently in almost the same position. 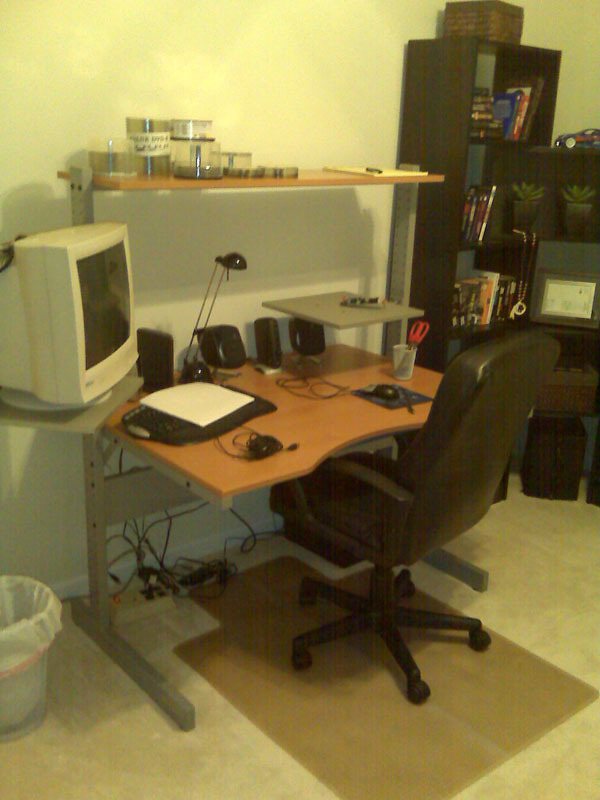 I almost ordered a Geekdesk, but ended up getting a used IKEA Fredrik (sp?) desk and setting it up in a standing position. I certainly recommend going the frugal route first; if it doesn't work out, you can always re-sell the desk on the used market and get the expensive model later. For those who still sit 8+ hours a day: Work on the boss or setup a budget for an adjustable stand up desk. Having a fixed height requires that you adjust if you want to add a floor mat, wear different shoes, or want to throw a treadmill down. And sometimes, after standing for hours, you just want to sit down. Spending $800 dollars is justified for anything that is used 8 hours a day. Cool idea. I've done the standup desk thing before at work with a tall chair as a sitting option. I actually ended up using the chair most of the time so I switched back to avoid constantly vaulting up and down, but it was an interesting experiment for about 2 years. One concern I would have about this particular configuration is the lack of a keyboard tray. Ergonomically, you would want your eyes about level with the top of the monitor or maybe a few inches below the top. At the same time, you want your keyboard to comfortably sit below so that you can keep your elbows at about 105 degrees or so. With the addition of a keyboard tray, and possibly a monitor stand, this can be a really nice long term ergonomic setup. Found some tips on ergonomics at the link below, and these are inline (no pun intended) with what I have heard from the mandatory ergonomics training at my employer. I figured this would be good because I could have the surface area of 5 desks take the square footage of one. The only thing is that with this desk doing any sort of paperwork is impractical. I had a keyboard tray that pushed me out too far from the desk to lean over my paper/books, and the ergonomically ideal height for the monitor base was too high for me to comfortably reference papers. I switched to a simple IKEA corner desk and chair, and re-purposed my shelves to be regular storage (although I kept the space open for monitors, should I want to work standing on another computer. Either the keyboard is far too high, or the monitor far too low. This is like laptop proportions - awful ergonomics. I've been a huge proponent of the standup desk for probably two years now. One thing I see people get wrong ALL the time is the simple ergonomics - the top of the monitor should be at about eye level, and the keyboard should be just a little beneath the height of your elbows. I made a simple folding standup desk I could put on top of a regular desk and it's been fantastic. Very simple, easily folds flat, and sits nicely on top of just about any desk or table. If anyone wants details (and the sketchup file I planned with) just let me know! - desk board: free with the ikea legs. If want different dimensions, depth should be at least 18" so monitor can further away from you. * optional: $20 plastic sliding keyboard drawer to keep papers/notes. Got mine from Frys. I got this from amazon: http://www.amazon.com/gp/product/B000QA0EHI/ - goes from too-low-to-sit to too-high-for-work (I'm 6' tall), is sturdy enough for a laptop, and has lockable wheels. Best $50 I've spent. Helpful suggestions: Attach a long-cord power strip to your mobile table, so that only one power goes out, and that it doesn't kill your non-magsafe-connector when someone kicks the power cable. Also, use a large binder clip to attach mouse/keyboard/monitor/network cables to the table if you use a laptop and take it with you often. $8 stand up desk: eight 8" cinder block cubes at about a dollar each. Stack two high under each desk leg. Throw a piece of lumber between the top front cubes for a footrest. 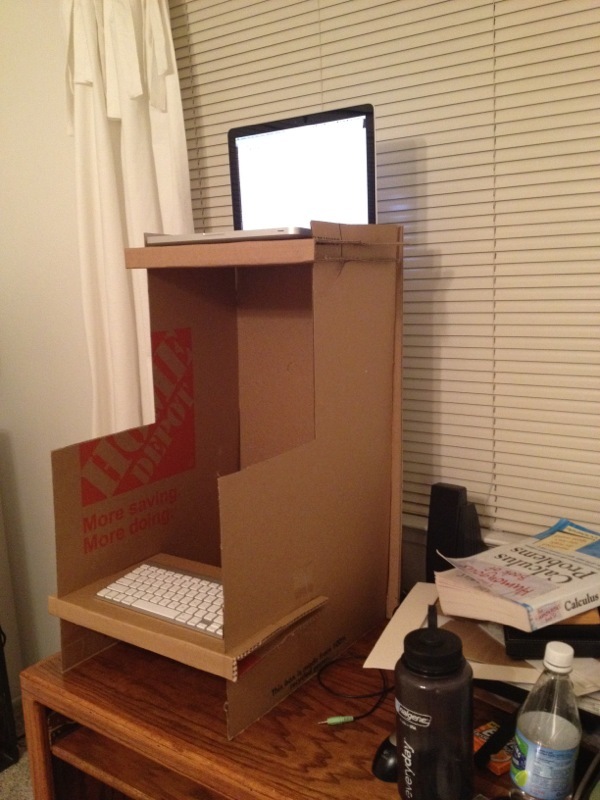 At the very least it's the cheapest way to decide if you like a standing desk. 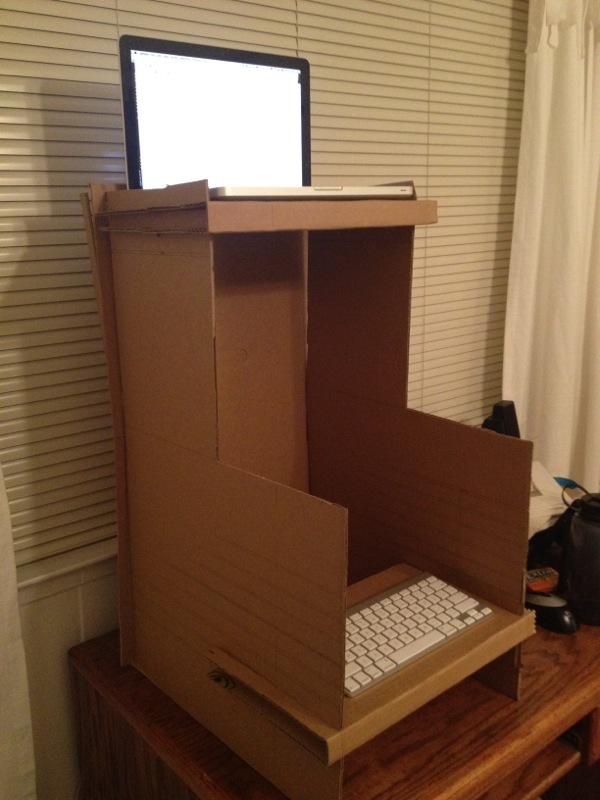 Free standing desk: Cardboard box on your desk. I built my own 3-tiered, sit-down or stand-up desk, link to pic below. Seated, the monitor is the right height for me, so as to keep my head up and neck straight. When I want to switch to standing, I just move the keyboard to the top level. I make the switch once or twice per day. And I can sit cross legged on the lowest platform (I dont like bucket/office chairs). track shelving also works, and is adjustable after you install it. The one thing that you miss with a desk like this is the ability to have a far off focal point behind your monitor. When you are working and thinking hard at a desk and you want to rest your eyes, it helps to have the space behind the monitor to be open so you can gaze off into the distance. Mounting the desk on the wall means that you can only gaze at a wall to rest your eyes. If I recall correctly, this design pattern is discussed in Christopher Alexander's "A Timeless Way of Building"
You could put a big mirror on the wall. I briefly tried an arrangement like this, which has just one surface for both keyboard and monitor. It worked horribly for me, though perhaps I am odd. Same here. My keyboard is around one feet below the monitor. My adjustable standing desk: $5? When I get tired I can switch from standing to sitting (use USB keyboard/mouse when sitting, laptop keyboard/mouse when standing). TL;DC: Laptop is on a bunch of small plastic storage boxes stacked on desk (and a random router box); keyboard/mouse on the desk surface. It looks like a wall shelf. Did you factor in the weight you would put if you lean on it with both of your hands or elbows. We do not lean on wall shelves but definitely lean on desks, and we do it unconsciously. May be we do not do it while we're standing, since I never tried working (with computers) standing. I just put a bunch of old computer books on my desk, in conjunction with a few Amazon boxes, and that seems to be sufficient. I actually have two desks. A standup desk AND a sitting desk, and I transfer my laptop between the two. This seems to be the best balance of sanity and health for me. I got this one http://www.ikea.com/us/en/catalog/products/S49843462/ They sell a stool that's the right height for when I do want to sit down, but it's uncomfortable enough that I do stand most of the time. My standup desk: Procrastinate on the ipad, walking around the house. Sit only when you write code. I just built some boxes out of plywood and put my existing desk on them. It was still a bit too low (my back was hurting) so I added a 2x4 on each side between the box and the desk leg until my back stopped hurting. Works great and very inexpensive! This is a great idea. I've always been more comfortable standing at a kitchen counter or using the adjustable-height computers we (no longer) have behind the genius bar. "A stud finder or old man that knows how to knock on the wall and tell where the studs are." Would you just search Craigslist for the old man? Sounds tricky. The top of your monitor should be at eye level. I can't tell from the picture, but it looks like your setup will lead to neck strain. Yep, I sure did. Damn, I shouldn't post before 2 cups of coffee have been consumed. Sorry guys.